Ekadzati (Skt. Ekajaṭī; Tib. Ralchikma; Tib. ཨེ་ཀ་ཛ་ཊཱི་, རལ་གཅིག་མ་, Wyl. 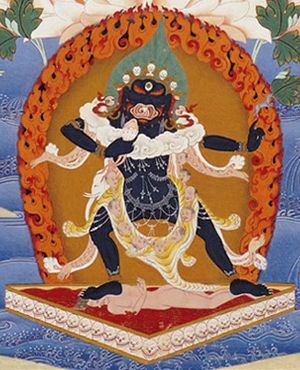 ral gcig ma) — an important protectress of the Dzogchen teachings. She is depicted with a single tuft of hair (the literal meaning of her name), a single eye and a single breast. This page was last edited on 13 August 2016, at 13:23.